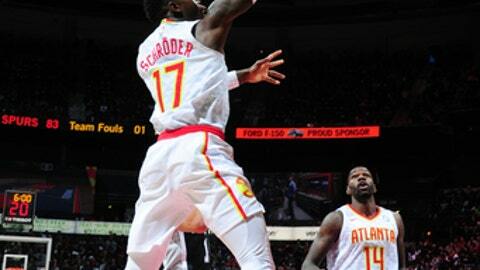 ATLANTA (AP) Dennis Schroder loves taking charge with the outcome uncertain in the closing seconds. It means even more when he can push the Atlanta Hawks to a rare victory over the San Antonio Spurs. Schroder scored 26 points, Ersan Ilyasova added 20 and the Hawks held off the Spurs in the closing seconds to win 102-99 on Monday. LaMarcus Aldridge had 25 points and 11 rebounds for San Antonio, which lost guard Manu Ginobli to a right thigh contusion in the first quarter and played without Kawhi Leonard as the star forward comes back slowly from injuries. The Hawks (11-31), who came in with the NBA’s worst record and had lost five of six, never trailed after John Collins’ tip-in made it 78-76 with 9:23 remaining. Danny Green’s 3-pointer with 31 seconds left cut the lead to one, but Schroder answered by dribbling down the shot clock and hitting a layup to put Atlanta up by three with 10 seconds left. Schroder hit two of the Hawks’ four free throws and the Spurs hit two before Green’s 3-point attempt bounced off the back of the rim with 2 seconds left. Kyle Anderson and Patty Mills each finished with 13 points for the Spurs. Collins and Dedmon each had 12 points for Atlanta. San Antonio jumped out to a 14-point lead midway through the first quarter, but Atlanta went on a big run to go up 33-32 midway through the second on Schroder’s 18-footer. The Spurs are third in the Western Conference despite a 10-14 road record. Spurs: Ginobli was injured while running into a screen from Dedmon. ”He got a good lick,” coach Gregg Popovich said. ”I think he’s going to be pretty tight for a while.” … The team listed ”injury management” as the reason that Leonard didn’t play. Leonard had 19 points and eight rebounds in 28 minutes when he returned Friday against Denver from a three-game absence with a left shoulder injury. Hawks: Outscored San Antonio 16-4 in fast-break points. … Out-rebounded the Spurs 50-37. When the Hawks lost at San Antonio in November, they were minus-14 on the boards. … Swingman Marco Belinelli scored 10 points in 21 minutes after missing his first game of the season, Thursday’s home loss to Brooklyn, with a sprained left ankle. … F Andrew White, a rookie formerly of Syracuse, Nebraska and Kansas, was signed to a two-way contract and will report to Erie of the G-League. Budenholzer lost his first six games against Popovich, his longtime mentor, but he’s 2-2 since. Budenholzer, in his fifth season with the Hawks, spent 19 years on San Antonio’s staff, including 17 as Popovich’s assistant. The Hawks have lost 20 straight in San Antonio, but they’re 26-19 at home against the Spurs and earned their first consecutive home wins in the series since 2002-04. Popovich, meeting with reporters in King’s hometown, weighed in again about Trump, whom Popovich said has consistently inflamed racial tensions for political purposes. Popovich has been outspoken about Trump since the former real estate developer and reality TV star began his rise through politics. He was asked Monday about King’s legacy and referenced Trump’s reported use of a vulgarity to refer to African countries. Spurs: Visit Brooklyn on Tuesday. Hawks: Host New Orleans on Tuesday.